Added on May 22, 2013 by ROSEGALLERY. Famed actor Jeff Bridges is a multitalented man who has expanded his creative skill set from acting on film to capturing images from behind the lens. In fact, he's managed to overlap his passion for film and photography by snapping shots on set, during his downtime. The legendary film star reveals the busy back end of film making without the glitz and the glamour. Nearly 30 years since he first began his personal behind-the-scenes project in 1984, Bridges has amassed quite a collection of mementos from his time on film sets. From his role as "The Dude" on The Big Lebowski to playing the one-eyed U.S. Marshall "Rooster" Cogburn in True Grit, Bridges jumped in and out of character, switching between his role as an actor and a photographer between takes. Using his Widelux camera, the passionate photographer was able to capture a wide assortment of monochromatic images throughout the years that include the cast and crew taking breaks, actors getting their hair and makeup done, the wonders of green screen, and even a few fun photos of fellow famous thespians like Matt Damon imitating the comedy and drama masks of commedia dell'arte. A collection of Bridges' photography has been published in his book titled Pictures and the multifaceted artist has just recently been honored by the 29th annual Infinity Awards with a nomination for his photography. Jeff Bridges, the Oscar winner you know and love as The Dude, won an award a few days ago from The International Center of Photography for the behind-the-scenes photographs he’s been taking on his own movies since 1984. They’re very impressive, and it’s also kind of fun to try to figure out which movie each of the photographs comes from. You can find more over on Bridges’ (terribly designed) website, and even buy prints. All proceeds go to charity (although, he really should set aside a dollar or two for web design). To view the complete image collection, click here. A colleague and I took a taxi to the ICP Infinity Awards last night, and as we read the evening's program he screamed, "THE DUDE is going to be there!" The moment we arrived at Pier 60, I spotted a very handsome Jeff Bridges in a killer suit, with his shiny salt and pepper hair pulled back in a ponytail. When I introduced myself, he did not disappoint. Infectious smile, mischievous eyes, very sweet—and lots of compliments about his GQ photo shoots. I didn't think the night could get better, and then I saw this video that the very talented Brian Storm created for the evening. Don't miss the part at 4:40—you won't be disappointed. Text and image courtesy of GQ. Added on May 2, 2013 by ROSEGALLERY. ICP commissioned MediaStorm to create a short film about each of the recipients to screen at the awards ceremony and to later remain online. The films serve as an introduction of the recipients to the audience as well as a showcase of their work, highlighting the motivations for honoring them with Infinity Awards. Did you know Jeff Bridges is a photographer. He has been photographing movie sets, which is actually very interesting to see in images. You get a unique view of the movie making process from an actor's view. Bridges uses a Widelux camera to capture wonderful moments that not many people have the chance to witness. He says of his work, "I think I have a perspective that not many people have. And I get to take advantage of all the strange sources of light on set." Hear more about his work here. Though Mr. Bridges is better known for his acting roles — The Dude in “The Big Lebowski,” Rooster Cogburn in “True Grit,” Kevin Flynn in the Tronmovies — he will receive special recognition tomorrow at the International Center of Photography’s Infinity Awards dinner in New York. Mr. Bridges has acted professionally since he was a young child, when he appeared with his father, Lloyd Bridges, star of the television series “Sea Hunt,” on that show. While attending high school in Los Angeles in the late 1960s, he built a home darkroom in a bathroom and fell in love with black-and-white printing. As his acting career took off, he left photography behind — until he appeared in the 1976 remake of “King Kong,” in which he played an paleontologist who always carried a camera. That rekindled his interest, and after his wife bought him a Widelux, he brought it to the set of “Starman” in 1984. His purchasable collection, “Pictures,” was published by PowerHouse Books, and he donates the proceeds — including from sales of individual prints — to the Motion Picture and Television Fund and several organizations that fight hunger in the United States. At times, his photographs form a visually refined family album that includes his father; his brother, the actor Beau Bridges; and his fellow actors. They provide a behind-the-scenes view of movie making and sometimes resemble early silent slapstick shorts more than they do fine art films. Mr. Bridges revels in using the Widelux’s long exposure time to take in-camera photos of his acting friends (Slide 12 and above) making comedic and tragic faces. 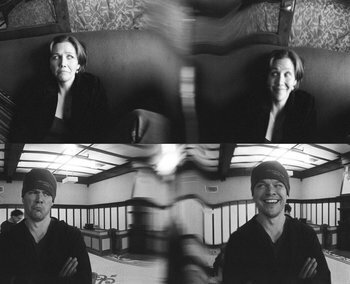 During a single exposure, they run from one end of the frame to the other and pose goofily for the camera. He wants to publish a book of his newer images and intends to continue photographing the sets of his movies. So, Mr. Bridges will abide. You can take comfort in that. Actor Jeff Bridges has been nominated for six Academy Awards for his work on the silver screen. In 2010, he walked away from the award ceremony clutching a statuette after winning the Best Actor prize for his role in Crazy Heart. When he’s not playing various characters in front of a camera, Bridges is well known for his interest in being behind the camera. He often serves as an unofficial behind-the-scenes photographer on Hollywood movie sets, documenting what things look like from an actor’s perspective. After getting in to acting, Bridges shelved his photography hobby until 1976, when he played paleontologist Jack Prescott in the remake of King Kong. The fact that his character carried a Nikon everywhere rekindled Bridges’ interest, and he started taking pictures again. The hobby finally joined him into the world of acting in 1984, during the filming of the movie Starman. While on the set, co-star Karen Allen suggested that he take pictures to create a photo book for the cast and crew. This was the beginning of Bridges’ privately published photo albums from the sets of Hollywood movies. Bridges is often seen on movie sets snapping away with his Widelux F8 panoramic film camera. He uses the 35mm version with a 28mm lens that pans nearly 180 degrees. Instead of a traditional shutter, the camera uses a slit that exposes the film as the lens pans. The Wide-Lux is a fickle mistress; its viewfinder isn’t accurate, and there’s no manual focus, so it has an arbitrariness to it, a capricious quality. I like that. It’s something I aspire to in all my work — a lack of preciousness that makes things more human and honest, a willingness to receive what’s there in the moment, and to let go of the result. Getting out of the way seems to be one of the main tasks for me as an artist.